Nov. 30, 1999: If you clean up dust with a vacuum cleaner here on Earth, how do you clean it up in space? No one knows yet largely because no one knows exactly how dust behaves. It is a major constituent of rings around planets, tails of comets, and even the seemingly empty space between stars. It might also be a problem in Earth orbit for large, long-life spacecraft such as space stations.
. NASA photo by Dennis Olive. To get a better understanding of what dust does in space, scientists at NASA's Marshall Space Flight Center are using the Dusty Plasma Laboratory to bombard individual grains with electrons, and then observe how they react. On November 15, Catherine Venturini, a graduate student at the University of Alabama in Huntsville, reported on work she is conducting with Dr. James Spann of NASA/Marshall. 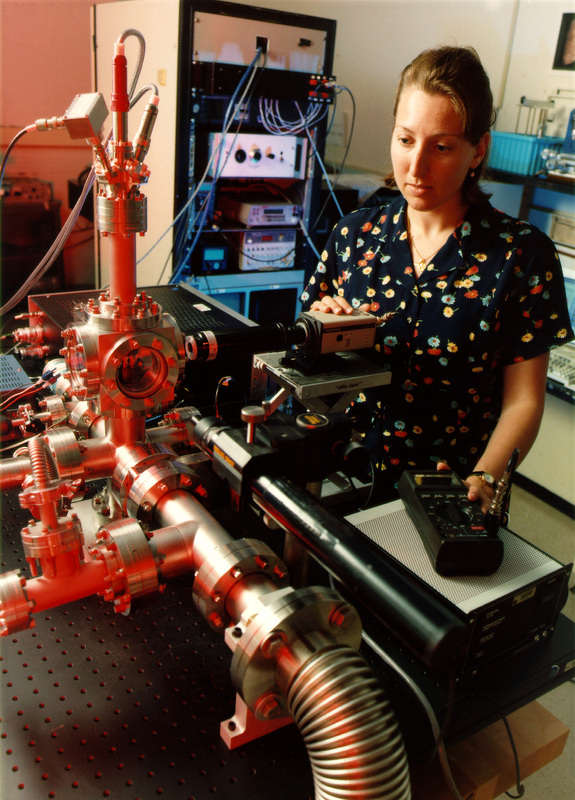 Venturini presented her results to date at the American Physical Society's Plasma Physics Division in Seattle. The Dusty Plasma Laboratory looks pretty much what it is: a high-tech plumbing assembly. Actually, it's a specialized vacuum chamber surrounding and suspending a charged dust grain in an electric field, which then measures how the charge is lost. A laser illuminates the grains while a TV camera makes a precise record of the grains' movements as the charges vary. Initial experiments with Dusty Plasma Laboratory used innocuous materials not found in space. "We started with salt crystals to get an idea of how the experiment works and how to catch the grains," Venturini explained. Salt dust was easy to make simply by suspending a single drop of salt water and letting it evaporate as the chamber was pumped down to a vacuum. "Then we moved to polystyrene microspheres because we know their exact diameter and geometry." The latest specimen they have been testing is aluminum oxide, a principal by-product of exhaust from solid propellant rockets. Most solid rockets burn a mixture of ammonium perchlorate and aluminum held together by a rubbery polymer. Most of the exhaust is a gas, but a significant component is aluminum oxide that will form small grains. For rocket boosters, most of the aluminum oxide is deposited near the launch pad or left to rain out of the atmosphere. 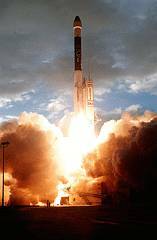 Most launch vehicles have liquid propellant main and upper stages, but a significant number use small solid rockets to boost communications and other satellites into their destination orbits. These two pictures illustrate the challenge faced in describing - mathematically - how dust behaves. On the left is an interstellar dust grain returned by the Long Duration Exposure Facility, and on the right a polystyrene ball used in Dusty Plasma Laboratory tests. The images are not to scale but show the complex geometries of dust grains which we perceive as just spots. Dusty Plasma Laboratory home page includes technical papers and more illustrations. NEAR spacecraft may find asteroid needs dusting: Dec. 16, 1998. Asteroids, too small to exert enough gravity to capture dust, may instead attract it with static electricity, providing a storehouse of primordial matter in the solar system and suggesting an intriguing twist on planetary formation theory. Tiniest of space bodies to get close examination: May 29, 1998: Astrophysicists start giving more attention to the smallest of astronomical bodies - dust particles. Dust to dust: April 6, 1998. New lab studies death of stars, origin of planets. Venturini noted that a number of scientists have reported detecting aluminum oxide in low Earth orbit. 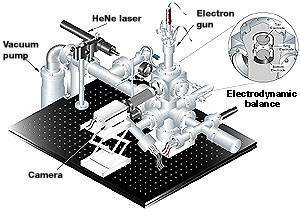 That - plus the ready availability of aluminum oxide dust from NASA/Marshall's optics laboratory - made the material an ideal candidate for the next stage of testing in the Dusty Plasma Laboratory. The grains are small, she explained, about 1 to 3 microns (1/50th to 1/16th the width of a human hair at about 50 microns). The grains don't get to float free, but are bombarded with electrons as they would be by currents in Earth's outer ionosphere which extends several hundred kilometers high. Right: Most of the blinding light from a solid rocket motor, like these strap-on boosters on a Delta, comes from aluminum burning with ammonium perchlorate. When such motors are burned by rockets raising a satellite's orbit, aluminum oxide grains are left in lower orbits. Credit: NASA. Among the observations they have made are the rates at which grains change electrical charges and try to become neutral. "What we hope to find is an equilibrium potential," Venturini said. "That has to do with when a electron beam is bombarding the grain, it will cause the lattice or internal structure to emit electrons." But the dust grain interacts with its environment along many different paths, and eventually should reach a constant potential. (requires Acrobat 4). Illustration by Ted Allbritton of SCSC for NASA/Marshall. 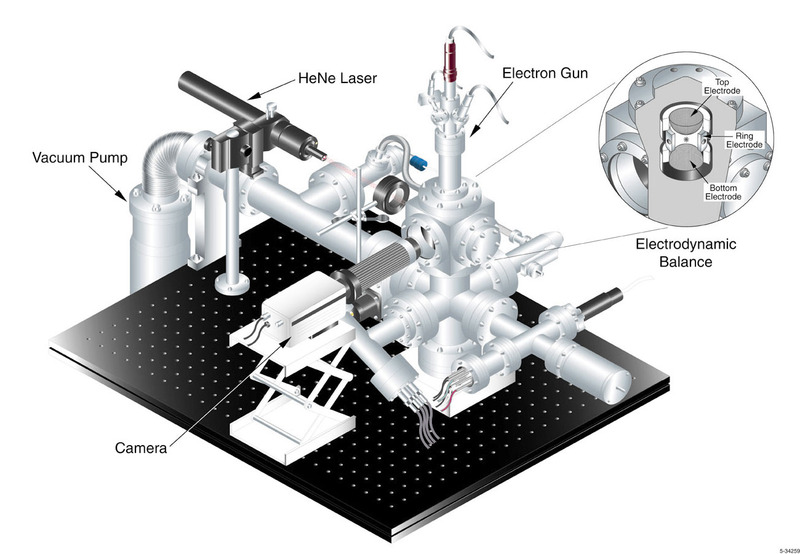 In a few months, Venturini and Spann plan to upgrade the Dusty Plasma Laboratory by adding a deuterium lamp that will provide ultraviolet light similar to sunlight. This is an important addition since sunlight alone can knock electrons off a spacecraft and give it an electrical charge. Among the environmental factors that may affect the grains are large spacecraft in Earth orbit. 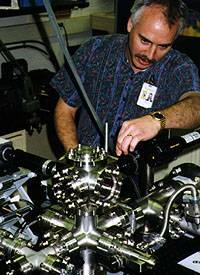 Right: Spann adjusts the laser on Dusty Plasma Laboratory. Credit: NASA. "Aluminum oxide is not a naturally occurring material," Spann said, "so you're not going to find it in interplanetary space. You will find it around rockets because it's a by-product of rocket exhaust." While a rocket will leave its exhaust far behind (after all, they are propelled in opposite directions), it can affect other spacecraft in lower orbits, especially with the anticipated increase in space launches over the next few years. "These results eventually could relate to the behavior of dust grains around large spacecraft that themselves are charged by the space environment," Spann said. He noted that it can also provide data for designers to consider in advanced propulsion concepts.